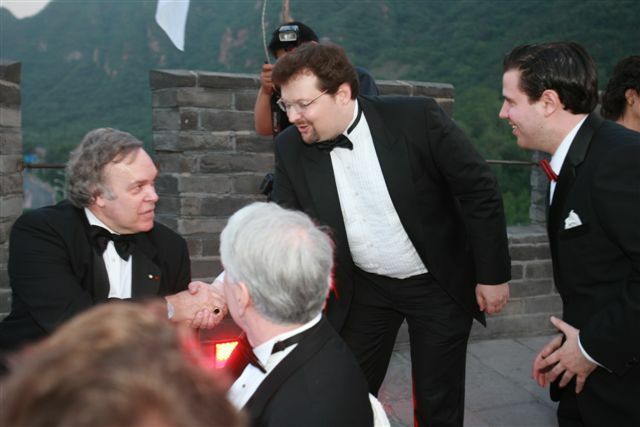 By Jim Boyce | I joined forty people on the Great Wall on May 24 for dinner with the world’s most influential wine critic—Robert Parker. He is best known for giving wine scores out of 100 points, scores praised and pilloried by critics and consumers, scores used selectively by marketers and salespeople. In honor of him, I will similarly grade the dinner, with up to 20 points in five categories–The Venue, The Wine, The Food, The Parker and The Details. Unlike him, I consider price when giving my score. Before I start, let me first mention the four questions peopled have tended to ask me about the Parker dinner. 1. Did you really pay RMB16,000 to attend? No. 2. Did you go for free? No. I called ASC, which organized the dinner, and discovered they had a spot left. I shifted into Silk Market bargaining mode. My position: ASC faced zero revenue from that empty seat, I had minimal funds in my (near) empty wallet, and by signing up late I would miss some benefits–the Champagne reception, the personalized Riedel glasses given to each guest, and so on. Thus, a discount seemed fair or at least that is what I argued. Several phone calls and 20 minutes later we agreed on the somewhat blogger-friendly fee of RMB10,000. This was still ten times more money than I’ve ever spent on a wine event. I asked China World Hotel’s Danny Kane to lend me a bow tie as I recently lost mine. Then I raced through eight vintages of Penfolds Grange, raced home to dress, and raced 75 minutes by taxi to the Badaling section of the Great Wall. I was the last to arrive for dinner, but I will likely write the most about it. 4. How was it? Here is the answer. Watchtowers lit in gold, walkways lit in silver–the Great Wall shone like an ornate necklace draped over a mountain of wrinkled black velvet. Long-silenced iron cannons pointed at the ghosts of invading hordes, white flags cracked in the cool stiff breeze. The moon hung low, orange as a ripe gourd. especially one as gorgeously decorated as was this. Even rarer is to drink in this view and drink in excellent wines with the most important critic, on his first visit to Beijing. The timing also held significance, at least for me. This section of The Great Wall sits on the edge of Beijing, a city about to have its “coming out party” by hosting the Olympics, in China, an increasingly powerful country on the global scene, including in the wine trade. Considering this, and that we enjoyed a crisp and relatively starry night, it would be harder to find a better or more timely venue. Nitpickers might say Badaling is a rebuilt part of the wall, that it is near a highway (though this is unseen from the tables and, for me, has a certain charm in contrasting the past and present), and so on. But nitpicking is all it is. Simply put, the venue was inspiring. This lineup gets marks for range (three continents), diversity (red, white, and dessert) and Parker palate loyalty (from the tarry Cote-Rotie to the fruit-heavy Shafer to the syrupy Kracher, they are “big”). I had imagined drinking something older than me, imagined a dusty bottle–perhaps from 1949–being produced at the last moment (in place of, say, the 2003 Port). Alack and alas, I now imagine monies that might be used for such wine were spent on renting and lighting the Wall. My favorite wine: Louis Jadot (lovely fruit), though all of the reds were excellent. My least favorite wine: the Kracher (too viscous). My favorite wine critic: The heavy industry manager who, upon hearing Parker describe the Haut-Brion as arguably the past century’s best wine, said the 1989 vintage less perfectly expresses the terroir than does the 1997. She also questioned whether Parker had properly evaluated the “violet” nature of one wine. Someone give this woman a blog! No shortage of wine or of glassware. Headed by chef Brian McKenna, the staff of the Blu Lobster at the Shangri-la Hotel restaurant worked in a makeshift kitchen to provide a seven-course dinner. I found the “crispy roasted suckling pig” a bit fatty (second course) and the “rabbit saddle, legs and kidneys” a bit dry (third course), though the “end-of-season lamb prepared two ways” was nice (main course)–all of them worked OK with the wine from what I recall in my notes and from memory. My favorite match: the “lightly spiced lobster risotto ‘sausage’ with avocado, tempura and lemongrass” (the starter). This dish had a lot going on—cold and hot items, spicy and mild ones, etc—but paired well with the fruit and acidity of the Louis Jadot. My second favorite: the “veal sirloin ‘treated like roast beef'” (third course), which came with a creamy sauce and Shitake mushrooms, that I enjoyed with the fruity Torbreck. My least favorites: the dessert and cheese dishes. The “slow-roasted pineapple and ginger lasagna”, with what I take was coconut foam bubbling from a shot glass, overpowered the Kracher like—obligatory historical reference—hordes breaching The Great Wall. I found the same with the “Fourme d’Ambert blue cheese” and the Port: more hordes, more attacked wine. One could give kudos to the kitchen for pushing the envelope. Then again, the envelope had already taken a mighty shove—Robert Parker, The Great Wall—and with the presence of the world’s leading critic the food should have been at most an equal, but definitely not major, partner with the wine. (As evidence, the wine received more prominence on the menu). If you are going to take risks on the food side, this would have been the ultimate opportunity to pair Chinese cuisine with foreign grape wines. Credit goes to the staff for operating under challenging conditions—the kitchen sat some distance from the diners, the dinner was lengthy, the night was cool—and for providing polite and professional service. I spent RMB1000 about a month ago to attend an ASC dinner organized for five winery owners from Bordeaux. One owner sat at each of the five tables of guests and, as a new course arrived, they rotated to a new table so that by night’s end we had met them all. Good times all around. I didn’t feel the same love at the Parker dinner, though I admittedly might have missed group hugs at the reception. Parker pretty much parked at the head table for four hours, which was good… if you were sitting there. Like 80 percent of the attendees, I was at one of the other four tables. I can’t help but think that had Parker spent a course at each table, we would have been happier and he would have learned a great deal about China’s wine market. In any case, Parker spoke several times during dinner. He acknowledged the tragedy of the Sichuan earthquake and stressed the importance of living life to the fullest. He said the dinner would “be the most historical food and wine event ever done” and “most of the wines for me are the very finest wine could be.” He rose several times during dinner to give his impressions of the wines. He also endured meeting me twice. First, Adam Steinberg, communications director for ASC, introduced me when I arrived. I exchanged a handshake and at most 30 seconds of small talk with Parker. Two hours later, as I chatted with St. Pierre on a smoke break, Steinberg, despite my reservations, introduced me again. Parker said something like, “Yes, we met,” and we shared another 30 seconds of small talk. Finally, an hour later, Steinberg offered to facilitate a third exchange. I declined. At best, I imagined Parker saying, “I know, I know, the blogger guy.” At worst, he might have gone for me with an empty wine bottle for annoying him thrice. I’m not sure how the others guests felt, but I’m fairly certain the head of a major magazine, one seat over from me, would have preferred more time with Peking Parker and less with Beijing Boyce. Then again, maybe she always looks unhappy. Parker and I shake hands; Steinberg prepares to tackle me should I hold on too long. I’ll start with the bad. This was Parker’s first trip to China, we were on the Great Wall of China, and it is arguably the greatest symbol of China. The key word here: China. Thus, you might expect the music to evoke said country, say in the form of one of those all-female qipao-wearing quartets that play the pipa, erhu, and other traditional instruments. We had a harp player. She plucked Que Sera, Sera. She strummed Edelweiss. She did songs that someone who owns The Greatest Hits of Lawrence Welk and the soundtrack to The Sound of Music would love. I don’t doubt her talent. It’s a context thing. The same goes for the CD played while the harpist rested her fingers. I heard some “You know how to turn me on / Oh, you got it going on” song three times. (Almost as bad as my repeating a CD five times at a 1500-person Fourth of July party in Beijing three years ago. Except that music was good). Attendees received personalized Riedel glassware, an autographed copy of Parker’s 700-page tome The World’s Greatest Wine Estates and, in some cases, empties of the bottles from the night. The menus were embossed on a series of thin bamboo slats and could be rolled up as a souvenir. The wine in each glass was identified by a coaster beneath. The candles sat deep within a centerpiece thus preventing the wind from blowing them out. Good attention to detail all around. St. Pierre gave a self-described shortest speech ever: “Who the hell wants to listen to me when we have Robert Parker here?” He later described going to the toilet as “one hell of a trip”, an accurate assessment given how far away the facilities stood. On the other hand, these were high-end porta-potties, with wood-panel floors, solid bowls, toilet paper, and sinks. There were employees on hand to help patrons up and down the somewhat hazardous steps. Finally, as noted, my decision to attend the dinner was less an eleventh hour decision than eleventh hour and fifty ninth-minute one. ASC handled this well. Steinberg met me in the parking lot and handed me a bow tie (thanks to him and Danny Kane for their efforts), navigated me to to meet Parker, and then took me to my table, after which… well, you’ve read the review. Note: In two years of writing about wine, the Parker dinner represents the most money I have spent on, the farthest I have traveled to, and the longest post I have written about any event. Credit goes to ASC for organizing this event—I doubt any other wine distributor at this time would dedicate the time, money, staff and willpower to pull this off and, from what I understand, this dinner was two years in the making. As someone who has organized or helped organize events, I know that when things go right, it is usually because of people behind the scenes taking care of the details. Credit also goes to them for an event that I will long remember. Sign up below for my China wine newsletter. And take a look at sibling sites World Marselan Day, World Baijiu Day and Beijing Boyce. Excellent article Jim! Hard to believe they could make such a faux pas on the music, but still…what a great evening!